The markets opened lower again and then dropped further in the first trading hour. Then, they stabilized and rallied for the rest of the day. The Dow and the SPX made new uptrend highs and closed up (+0,31% and +0,4%) while the Nasdaq lagged a bit and closed slightly lower (-0,05%). 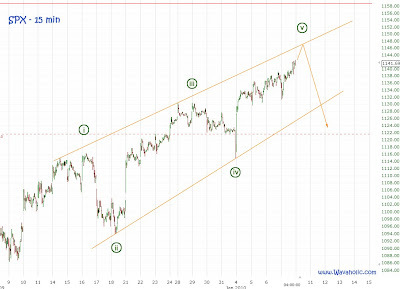 With the SPX being stronger than the Nasdaq in the last two days we got the nice situation that both indices are 1,5% below my target of 1158 in the SPX and 2340 in the Nasdaq. But actually I expected the market to peak in the first week of January. Since tomorrow is already Friday I suspect that the markets won't reach my targets. But tomorrow the non-farm employment change and the unemployment rate will be released so it could be quite volatile before and right after the open. As expected the slow rise continued. Tomorrow will be day 5 so it should be the last day before the market tops (see yesterday's post). Day 5 in waves [i] and [iii] began with a gap up and a rally after the open. Then the market peaked before midday and began to drop in the afternoon. So, we might see something similar tomorrow.